For better or worse, but mostly for worse, we’re almost done. 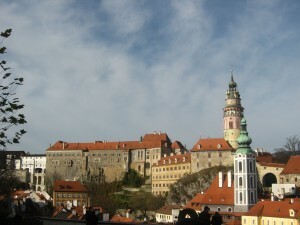 Almost to the point of packing suitcases and getting on transatlantic flights headed for the States. Even with finals looming and the calendar telling us flat out that we only have four days left together in Salzburg, it’s a bit surreal. Last weekend, though, it seemed like we were never leaving. That I was going to spend the rest of my life cooped up in my dorm room writing research papers. Because of my three independent study classes I had three very large papers to write, and fortunately for the procrastinators among us some conveniently timed Austrian holidays gave us a five day weekend to work on them. Over the course of those five days I managed to finish nearly all of the work I have left for the semester, my only remaining tasks being editing one last paper and writing a short summary for my International Conflicts class. My papers will not be the best papers ever written, but they definitely include some creative turns of phrase included to help reach the 6,000 word minimum. But tales of homework make for a pretty boring blog post. Saturday night Rachelle and Max and I took a study break to head into town and catch a ‘Krampuslauf’ which means Krampus Run. The Krampus are creatures said to accompany St. Nicholas the night before he makes his rounds, and they weed out the naughty children by hitting them with whips or switches. It’s a tradition that basically only exists in Bavaria and this part of Austria, so we figured we had to see it for ourselves. There are officially sanctioned Krampus who aren’t allowed to really hurt you, but then there are also unofficial groups who have no qualms about actually beating people. 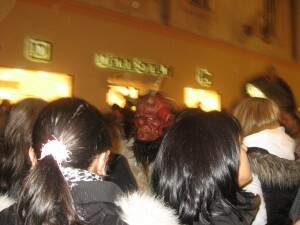 A combination of both types floated about Salzburg the week leading up to St. Nicholas Day, and many friends reported having not so pleasant encounters with the terrifying men in furry suits and scary masks. When the last Krampuslauf of the season rolled around we were a little nervous, but mostly convinced that they couldn’t possibly be as scary as everyone had said they were. We bravely made our way to the route of their run and then stood in wary anticipation. The crowd got thicker and we eventually heard bells in the distance. When the six or so Krampus got to our spot on the street we found ourselves struggling to reconcile our desire to take photos with our even stronger desire to run for our lives. Krampus are scary. Really scary. They are huge and get right up into your face threatening to hit you. Everyone in the crowd was screeching and attempting to hide behind one another as the Krampus grabbed random people from the crowd and tormented them. When the Krampus (plural Krampi? Krampese?) finally shuffled past us we heaved a sigh of relief and made our way to the bus to get back to our dorm and back to safety. It must have taken a good half an hour before my pulse returned to its normal rate. All I can say is, no wonder Austrian children are perfect little angels. If American kids were threatened with a Krampus instead of lame coal in their stockings, they’d be much better behaved too. The Krampuslauf was the most drama I experienced this week. We went out for Italian food with Kirsten and Rachel on Tuesday night but that was just about the only other time I left the dorm during our five day homework marathon. Thursday night brought the last karaoke night of the semester at O’Malley’s, an evening of terrible singing and smoke inhalation to be enjoyed by all. 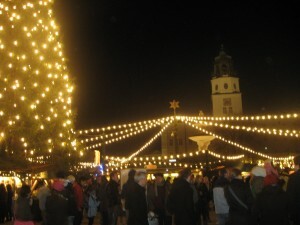 Friday we ventured back out to Hellbrunn Palace to see the Christmas Market there. I had been with my parents, but Kirsten and Rachel had yet to see it, so we wandered around for a bit, though their lack of reindeer disappointed me yet again. Friday was a shopping day, and Rachelle and I trekked through the Christmas Market in search of various things for ourselves and our friends. I’m trying real hard not to think about the fact that each time I go into a certain store or catch a certain glimpse of the town might be the last time I do so this semester. Taking my mind off of our imminent departure was a Christmas party at Frau Schoettke’s today, which was fun and probably the last time a large group of us AIFS kids will be together outside of class. 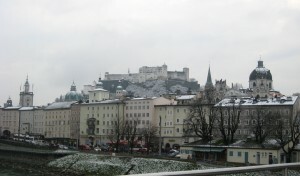 It also snowed this morning and again tonight, so we got to experience something at least resembling a snowy Salzburg. It didn’t stick on the roads, but walking home from Frau Schoettke’s tonight was about as wonderfully Christmassy as it gets. This week: the Silent Night chapel, final exams, one last kebap, packing, and more crying than I’ve done in a while. Last Saturday Rachelle, Maya, Kirsten, Rachel and I woke up early to spend the day making Christmas cookies. We lugged our baking ingredients and cookie cutters to Frau Shoettke’s apartment and spent the rest of the day crowded into her tiny kitchen improvising recipes and taking hot trays out of the oven with tea towels instead of hot pads. Apparently Frau Shoettke doesn’t believe in them. Hot pads, that is. She did, however, have a set of American measuring cups so we managed to mix most of our four types of cookies (plus fudge!) rather well. Our biggest debacle came when we realized we had forgotten that sugar cookie dough needs to chill before it gets rolled, and we had somewhat stupidly saved the sugar cookies for last. When we finally attempted to roll it, the dough stuck to the table and refused to allow us to pick up any cut out cookies we managed to create. So into the freezer it went. Eventually, after adding an alarming amount of flour and learning to roll the smallest amount of dough at a time we got all of our cookies made, hedgehog shaped ones and all. More importantly, they all tasted quite good. Later Saturday night we went to a “Latin Party” hosted by another university here in Salzburg, and the girls attempted to teach me some semblance of actual Latin dancing. Not sure that worked out so well. Sunday was busy yet again as we had planned to get out to the stadium to see a football game at least once while we’re here, and Salzburg was playing Vienna on Sunday, a rivalry worth seeing. We met our friends at the bus stop about two hours before the start of the game in the hopes that we could get there and get tickets before they sold out. We weren’t quite anticipating what happened next. At a bus stop outside of town, in front of a random fire station, the bus driver turns off the bus looks at the five of us strangely for staying in our seats and says “Ende.” The bus was done. According to our map and all other available information that bus went all the way to the stadium. Just not for us, apparently. At a lose as to what to do, we got off of the stopped bus and tried to assess our situation. We were in rural Salzburg and an unknown distance from our destination. I had carried my road map with me every day for the entire semester until I gave it to my parents the weekend before and forgot to get it back, so of course we had no actual map when we needed it. Turns out Kirsten is directionally skilled even when it comes to bus maps, and she managed to lead us on a scavenger hunt of sorts from bus stop to bus stop until we found the stadium on foot. Never a dull moment. When we got to the stadium we got in line for tickets and managed to get five for the fan/student section. This meant we got cheap tickets, but we had to sit with the crazies. Or stand, because the only time we got to sit was during halftime. But before we even found our seats we had to get into the stadium which involved going through security. We got in line and were soon thereafter informed that we were in fact in the mens’ line. Oops. So we got in line again. After we’d all gotten through the correct line they told us we couldn’t get into the building through that door because our seats were on the other side of the stadium. Cue walking back around, through a third security line, and then finally into the stadium and into the fan section. 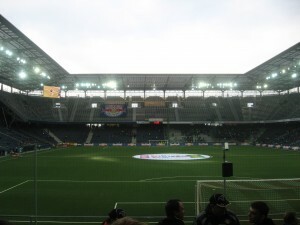 We cheered on the Red Bulls for the next ninety minutes or so, clapping and yelling German gibberish like the crazed people around us. The section had its own drum to beat out the chants, and two men who led the crowd in cheering. We picked up some of the words/meanings of the chants, but for the most part it was just fun being around all of that enthusiasm. 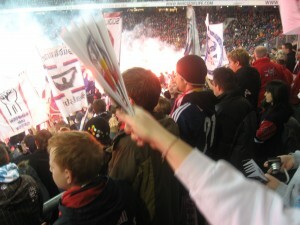 The Vienna fans were across the field from us, but they had their fair share of flags and choreographed chants as well. They even had flares. As to why they took Rachelle’s water bottle away at security but let the fans in with flares I haven’t a clue, but it made for quite the scene. The game ended in a 0-0 tie, but perhaps it’s better no one scored a goal. Regardless of which team it had been, I think I would have feared a bit for my life. Monday and Tuesday were homework days. I still have epic amounts of papers to write, so the spare moments I have are mostly spent pretending to work on them. Wednesday morning AIFS treated us to chestnuts, gingerbread, and punch at the Christmas markets so that was fun. We watched lots of adorable Austrian school kids walk through the market on outings with their teachers. At one point a teacher bought one cotton candy for the whole class to share and then held it high and the air while tearing off small pieces to feed to the kids. It was like watching little birds. Adorable. Later on Wednesday, for one of our last Womanly Wednesday’s of the semester, a few of us got together to eat cake for dinner and watch movies. I’m fairly certain there’s a direct correlation between eating cake for dinner and craving vegetables for days afterwards, but no regrets in the nutrition department. Thursday morning we had our departure meeting which really brought home that we’re leaving in less than two weeks now. We got information about our return flights and filled out program evaluation forms. Paperwork shouldn’t make anyone sad, but I almost burst into tears just thinking about how hard it’s going to be to say goodbye to Salzburg itself and all of the people I’ve met. Good thing it’s a long drive to the Munich airport because I’m going to need all of that time to achieve anything resembling dry eyes I’m sure. Trying not to think about it. I have papers to write this extra long holiday weekend so that’s at least distracting me. Happy that it snowed a bit this morning, enough to stick for a while but only until it started raining. Hoping to catch the Krampus tomorrow night. What are Krampus you ask? That, my friends, is for another blog post. Well, I had a lovely picture of the tree I can see from my window all pretty and orangey-yellow, but my computer won’t let me upload it at the moment, so you’ll all have to take my word for the fact that fall in Salzburg is gorgeous. That is, when it’s not grey and rainy and disgusting outside as it seems to be frequently. We’ve been hanging around Salzburg for the passed two weeks getting caught up on homework and marveling at how fast our semester seems to be speeding by. Last week we had some classes canceled so I had lots of time to eat Halloween candy and hide away in the library doing research for my impossible asylum law research paper. I must say that the libraries here do not make research easy. We’re very lucky that so many of the books are in English, but a trip to the library really shouldn’t be such an ordeal. If you ever do manage to find the book (and the library! There’s one for pretty much every department.) you’re looking for you might not be able to check it out for more than a week. Blargh. But we’re managing. Taking a break from studying, Rachelle and I adventured all across town on Friday to find a Halloween store. 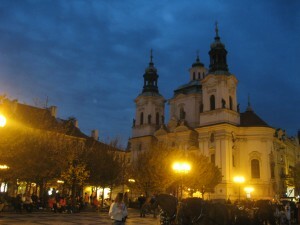 Halloween is celebrated here, though it’s not as popular as at home. She bought a witch hat and I got some silly glasses that, when paired with my tie-dye shirt, improvised a fairly decent hippie costume. We put on our costumes later that day to have a little mini Halloween shindig with some friends, but I ended up spending actual Halloween working on the same ridiculous paper. And eating candy, so it counts as celebrating. The rest of the weekend (and an added holiday made it a four day one) I probably didn’t leave the dorm more than twice. I was going a little stir crazy by the end of it, but when I look at the calendar and realize I don’t have another free weekend until December I knew I had to get as much work done as possible. This week the students here in Austria were protesting budget cuts that were affecting higher education so they were staging sit-ins in some of the classrooms and posting signs around the university. Our Austrian Culture had one of the students come in to explain the movement to us, and it was really interesting. They don’t pay any fees at all to go to a university here in Austria, and the threat of implementing even 300 Euro a year tuition prompts outrage. Such a strange concept to all of us who pay so much to go to school, but very interesting to get a real world example of how the Austrian welfare state plays out in reality. Yesterday afternoon I was sitting in the room by myself when an Austrian man (a maintenance main perhaps?) came in and started speaking German to me. At first I assumed he was going to fix our only just barely functioning heater. Wrong. He actually wanted to measure our bed frames. Hmm. He had me help him hold the measuring tape and everything. He even measured mine twice. He kept mumbling to himself in German, and then he was gone just as quickly as he’d come. No idea what that was all about. Then last night instead of making dinner with the girls like a normal Wednesday, some friends and I decided to take advantage of student night at the Salzburg opera and went to see The Marriage of Figaro. It was very entertaining even if we had little concept of what was going on most of the time. Unlike the Vienna Opera, Salzburg’s only has subtitles in German so we had to rely on our German skills and my friend Kirsten, who had wisely read the story before we went, whispering basic plot points every so often. Of course any understanding we might have had went out the door when the show ended with random villagers coming to attack the main characters with pitchforks. Pretty sure Mozart didn’t write that part. Today I did laundry and rather than fight for the one dryer we have for our entire complex I now have clothing strewn about the room. I just hope some of it dries before I need to pack for Florence later this evening or I may just be breaking out the hairdryer so I have some dry sock. 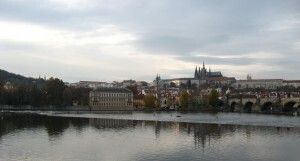 But that leads me to Florence! Italy! Rachelle, Rachel, and Kirsten and I have an overnight train at 9:15 tonight. Here’s to three days of pasta, pizza, gelato, and lots of wonderful museums.